How to Prune Roses | Starkie Bros. Roses are beautiful blooms and one of the most popular flowers in gardens and landscaping. With proper pruning, you can keep your roses looking their very best, making them truly a showpiece in your yard. Improve air circulation through the plant, discouraging pests and diseases. Permit sunlight to penetrate the plant for more lush, even growth. Remove damaged, diseased or pest-infected areas to preserve the plant's health. Help keep the plant's shape or train it to grow along a trellis or in a challenging space. Concentrate growth and nutrients for the largest, most lush blooms. Encourage reblooming after the first flowers have faded. With so many reasons to prune your roses, it is essential to be sure you are pruning properly to give these flowers the best possible care. 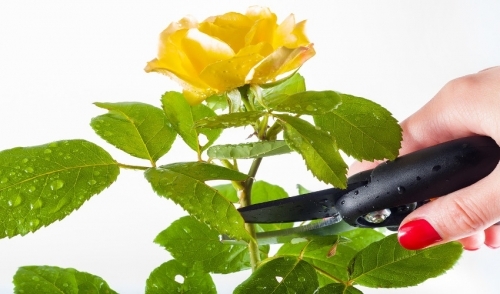 Before you pick up pruning shears and start trimming your roses, you need to be sure it is the proper time to prune the plant for the best results with the least stress. While the exact time to prune roses varies on overall hardiness zone, plant condition and rose type, most roses are typically pruned in very late winter or very early spring, while the plants are still dormant. Pruning should be done before budding begins but after the last hard frost to minimize stress. There are two general exceptions to this timing, however. If your roses become diseased or damaged at any time, pruning them as quickly as possible will help minimize those problems. Also, if your rose is a reblooming variety, summer pruning – deadheading – is essential to encourage more blooms later in the season, and should be done as the first flowers droop and fade. Regardless of the type of roses you have or when you plan to trim them, the basic steps of pruning roses remain the same. Always use clean, sharp tools to ensure smooth cuts. Ripped or ragged cuts cause greater damage and stress to the plant, and a dirty blade may transmit diseases between canes and infect an entire plant. Wipe your tools carefully after each cut to minimize contamination, and check them several times throughout the rose season to be sure the blades are sharp. Wear long, thick gloves so you can gently handle the roses without suffering from thorn pricks. Gauntlet-length gloves are best for larger rose bushes, but if your plants are smaller, shorter garden gloves can be suitable. Opt for heavy duty or puncture-proof gloves for the best safety. Remove any damaged or diseased parts first, taking care not to transmit any possible contagion to other parts of the plant. Trim well below any necrotic tissue to be sure infections do not spread and the plant can recover more easily. Prune mature roses from the base, opening the center of the plant to permit light and air to circulate better and give the plant room to grow. Remove all crossing canes or shoots that twist at awkward angles through the plant to ensure a smooth, consistent form. Remove any suckers from the rootstock or lower canes of the plant, as well as any weak branches or twiggy growth. Instead, preserve the firmest, healthiest canes that will produce healthy growth after pruning. Make cuts slanted at a 45-degree angle, positioned one-quarter inch above a bud. This will ensure the bud can grow properly but will not leave space for additional suckers or unwanted growth to develop. If you want a slender, upright rosebush, prune above inward-facing buds to help keep the plant more compact and encourage vertical growth as new shoots reach for the sun. If you prefer a bushier plant, prune above outward-facing buds to encourage more lateral expansion. After you have finished pruning, gently remove any remaining old foliage from the entire plant and discard or compost it properly. This will keep the plant's nutrition concentrated in new growth and will tidy up the area to show your roses in all their glory. Apply a 2-3 inch layer of mulch around the plant to preserve moisture and discourage weeds. Do not push mulch up against the plant's base, however, which can lead to pest or fungus problems. Depending on the condition of your roses and any local difficulties in your area, you may want to consider a horticultural oil treatment after pruning roses, or applying fertilizer within a few weeks to nourish emerging growth. In many cases, however, a good pruning will help keep your plants healthy and you'll be enjoying fresh new blooms again in no time.